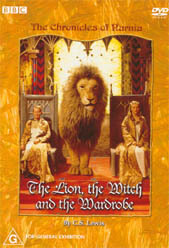 The Lion, The Witch and the Wardrobe is one of the most unique and wondrous children books of modern-day fiction that was written by the talented C.S. Lewis. The Chronicles of Narnia, a BBC television production, faithfully recreates the fantasy world of C.S. Lewis that is filled with fauns, unicorns, nymphs and giants. On a quiet summers day in the English countryside, a young girl called Lucy accidentally stumbles upon a wardrobe that leads into the mythical world of Narnia. The world of Narnia is unfortunately a cold and dangerous place that is ruled by the insidious and evil queen called the White Witch. There is however a prophecy on Narnia that when the sons and daughters of Adam and Eve return (the race called man), it will signal the return of Aslan, a powerful and noble lion king who will band together with these children to liberate the denizens of Narnia. And when the White Witch learns of their presence, a deadly game of cat and mouse begins as the children, Peter, Susan, Edmund and Lucy try to make their way to Aslan so that they can fulfil their prophecy. Before this review can go any further, it should be noted that this television series is specifically aimed at children or adults who have read the adventures of The Lion, The Witch and the Wardrobe when they were children themselves. The acting in the series is a little on the rough side, especially by the White Witch and Peter but Lucy, the youngest in the film quite literally saves the series by her innocence whose smile could break even the most staunchest of people. The special effects in the series uses a combination of puppets, costumes and animation that really helps portray the world of Narnia. Easily one of the most amazing special effects in the movie is the giant lion puppet that is Aslan himself. The video quality of The Chronicles of Narnia is a little on the poor side as many of the colours are washed out and it actually gives the series a much older feel than it really is. The sound quality on the other hand uses Dolby Digital 2.1 surround and is quite acceptable with no lip syncing or any audio problems whatsoever. The Chronicles of Narnia is a great children's title that I would highly recommend to parents who wish to introduce their children to the amazing world of C.S. Lewis that features a classic battle between good versus evil. The best part of the story is that the series actually draws the viewer into the world of Narnia and I'm sure every child that has read or seen this classic has actually tried to enter Narnia through their own Wardrobe. Highly Recommend!